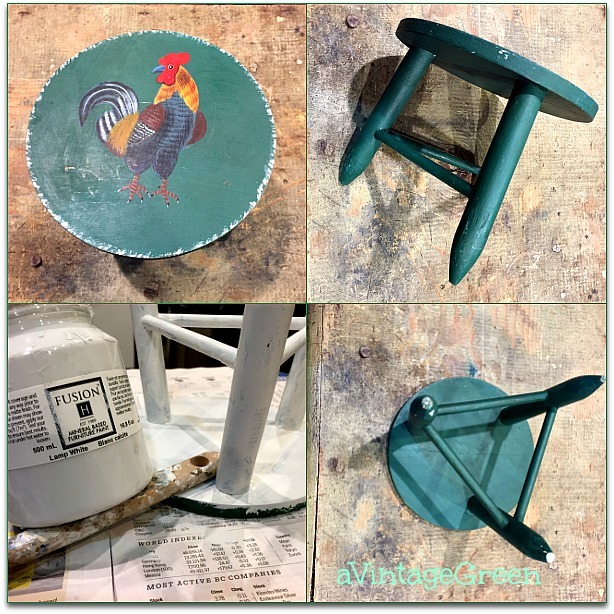 Painted a small green stool Lamp White and added a stencil (see end of this post). 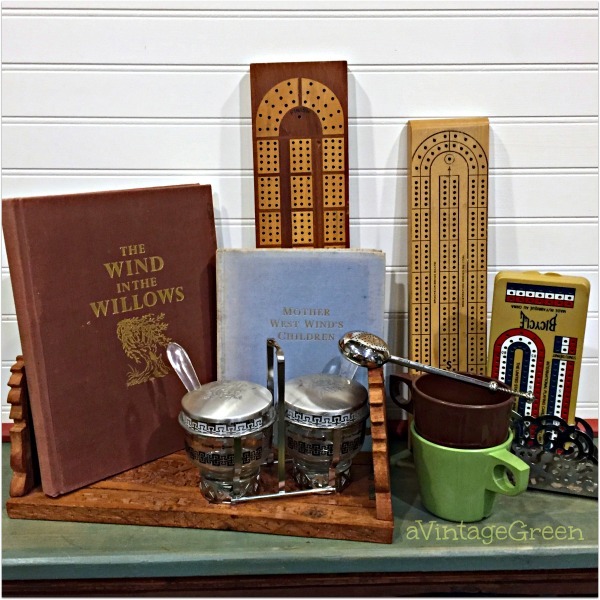 Thrift store treasures - crib boards, a carved folding book holder, a Libbey mid-century condiment set, Beauford mugs, napkin holder and long handled spring loader tea leaf holder. Love finding anything brass that shows age, rarely polish, just wash and rub dry. 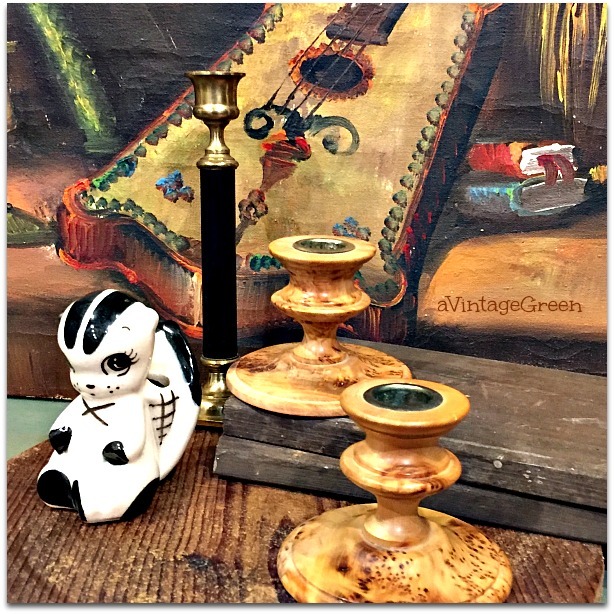 Birds Eye Candle Holders, an Enesco Posy Holder Skunk (I love the painting in the background). The color drew me to these hard cover books. They are German novels in good condition. Use this picture as the background for playing solitaire. 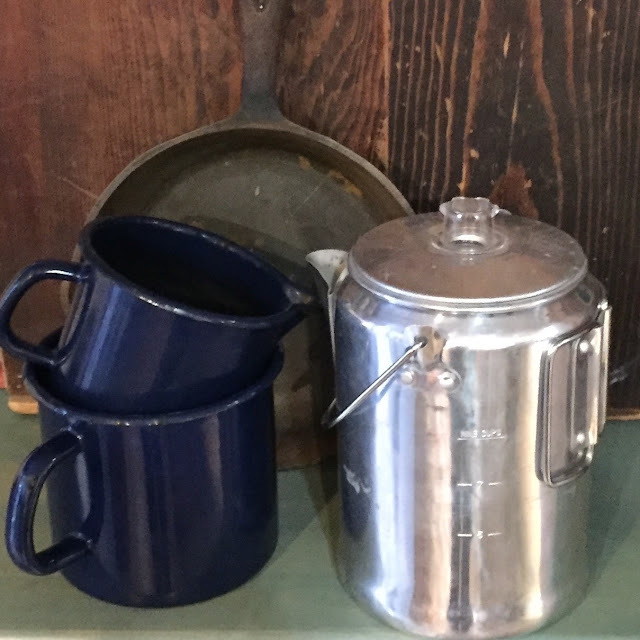 A hint of camping memories, still have our original propane camp stove and coffee pot (not this one) in my shed, tents have been given away, too hard to get up from the ground. 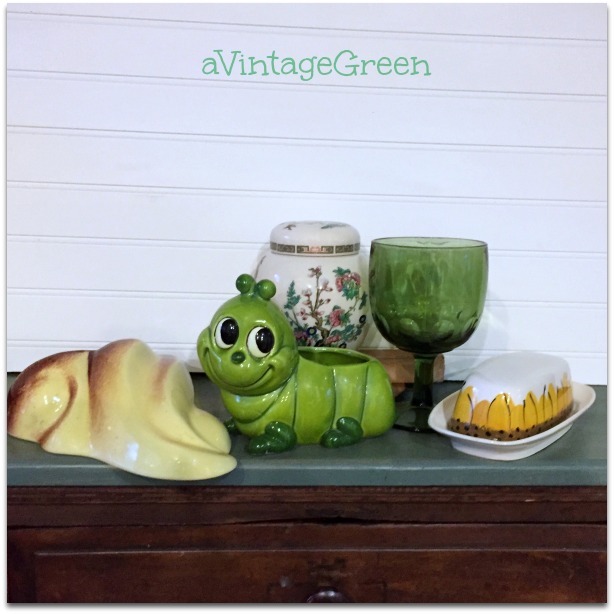 This is such a cheerful catterpiller planter, the yellow and brown ceramic is a wall pocket, behind is a Tree of Life Sadler Tea Caddy, a green footed goblet and a mid-century butter dish, Sunflower pattern. 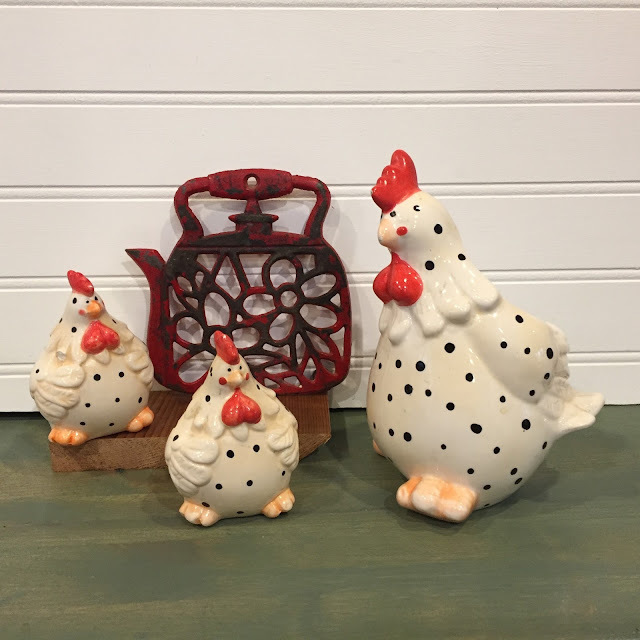 Cast iron well used, some red paint left on a trivet and a small set of salt and pepper chickens and a chicken spoon holder in a small grouping. 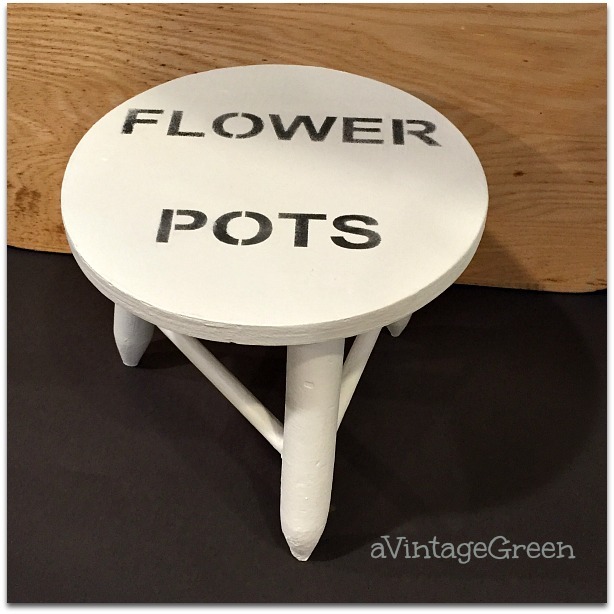 Wanted to paint this little stool/plant holder for some time (yes, thrifted). It was beginning to look scruffy. 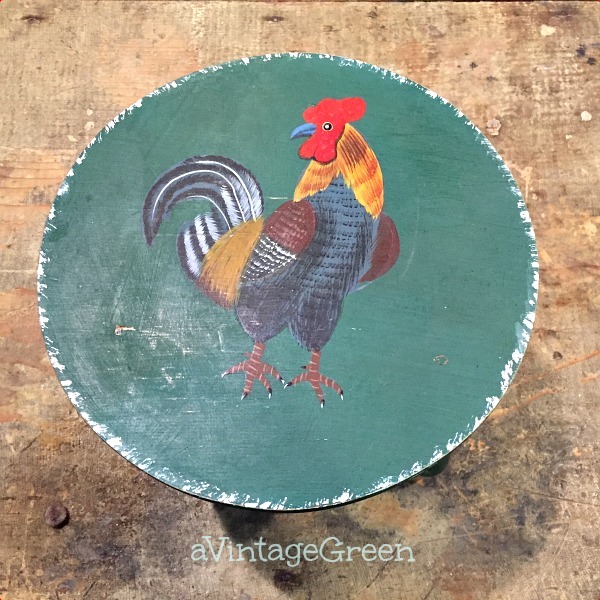 This is my first use of the garden stencil from Muddaritaville - and when I find a board wide enough I will try out the entire stencil. Used CeCe Caldwell Beckley Coal for the lettering. Added Fusion Tough Coat Sealer Clear finish (2 coats) after a very light sanding. Always a treat to have an elf visit and a Royal Winton Spring Flowers plate for a background. Oh my, you picked so many great finds! 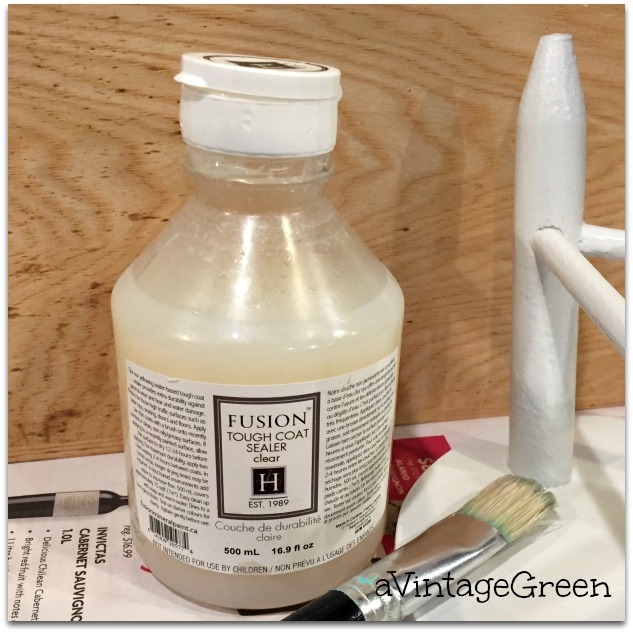 Your stool turned out so much better with Fusion. Looks like you made a great haul. Joy, I love the birds eye candle holders and the colorful plate in the last photo. Thanks for sharing your finds. I always enjoy it. Sylvia D.
OOOH! 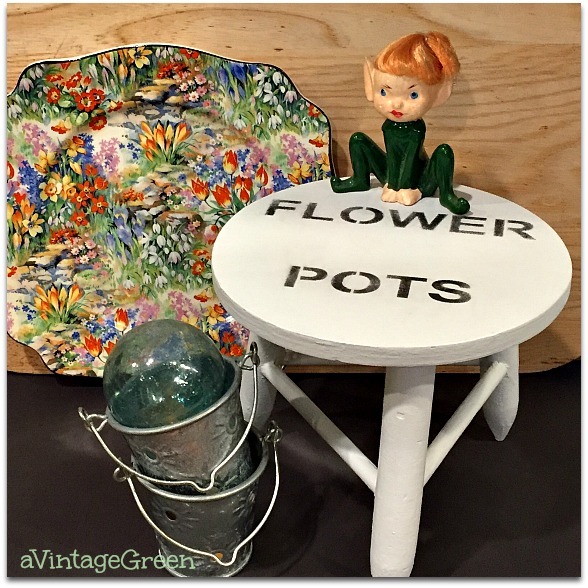 My favorite of your finds is that spring flowers plate! It's so colorful! So happy to have found you Joy. I'm loving your Blog. I'm a vintage girl too. You have capture my heart. That caterpillar is calling me. I always love peeking at your treasures! Those books are so pretty, I would've had a hard time walking away from them, too. I would have chosen the books for their color too. Great look. Crib boards are very interesting. 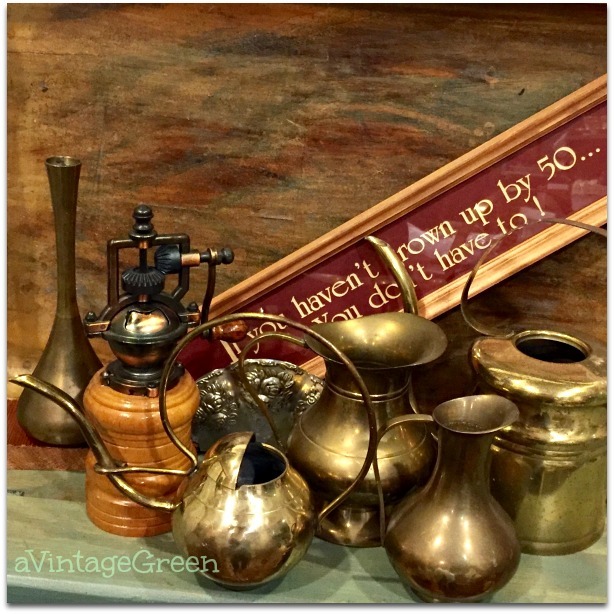 Thanks for sharing your fun finds. Where do you find all these lovely treasures Joy. Love the little elf on your newly renovated footstool and all those brass bits and strangely enough the hubby and I were just talking the other day about going camping again. We haven't been in such a long time but I suspect we'll need to get some of those raised camping stretchers. I'm not sure if these old knees of ours can handle the long upward stretch off of a camping mattress. You found some great things. Love the stool makeover! Love those books, Joy! 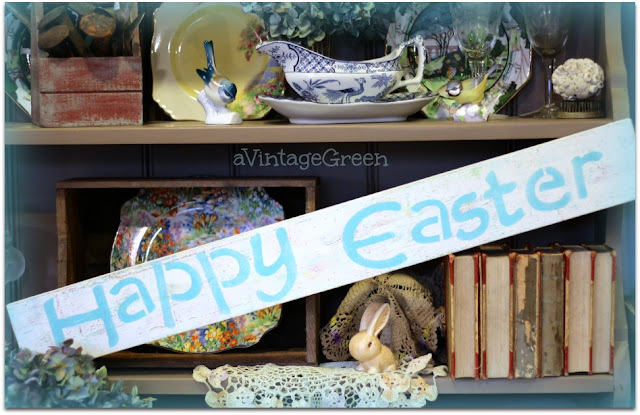 Thanks for sharing at Vintage Charm! You always score so many great finds. I loved scribbae and played it for years with my ex but I can't for the life of me remember how anymore. I read the directions and couldn't figure them out! Your stook makeover is cute and I too would have chosen the books! Great finds! Thanks for sharing at Thursday Favorite Things! 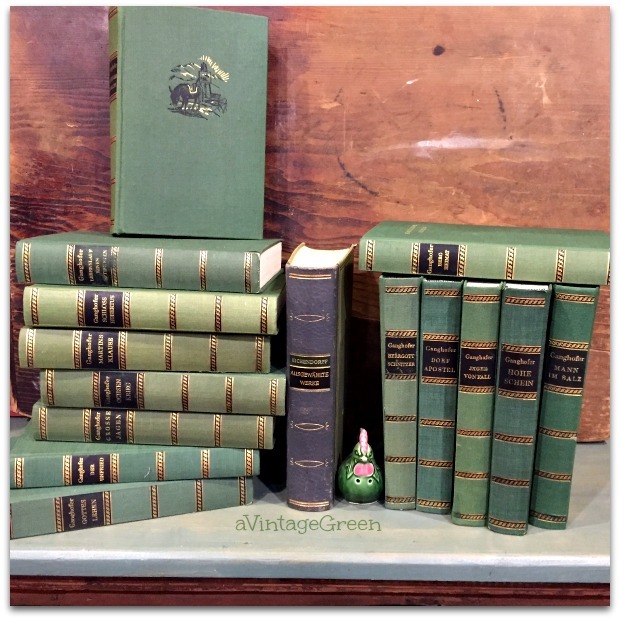 I love the Wind in the Willows...what a great find! And the little pixie at the end is very sweet! Hugs! Another fab collection of collectables to tempt any collector! Love the stool (I'd call it a tuffet like the one Miss Muffet sat on) and they way yo revamped it, good job. I always love seeing what you find Joy! Love the makeover on the stool. Thanks for sharing with SYC. My favorites are the chickens!